It's always good to stand out from the crowd, which is why Alphasonik remains rebelliously original. For more than 30 years, we continue to represent a unique blend of engineering, technology, design and performance. A claim to fame no other car audio manufacturer can make. From our legendary subwoofers and amplifiers to our revolutionary component speakers and bass enclosures, Alphasonik's refined and sophisticated styling and high performance products stand out among the competition. We have set the bench-mark in the industry through progressive technology by being the original developer of ground-breaking high voltage signal transfer and amplifier fan cooling. Alphasonik will continue to lead the charge in next-generation car audio and our relentless need to be the best car audio brand in the industry will forever empower us. Alphasonik dealers, customers, fans and core SPL and SQ enthusiasts stand by our orignality as we remain a legend in the 12-volt industry. SKU: AT2. Category: In Car Entertainment. Capacitors are used in car audio systems that require additional power on an instantaneous basis. This occurs when heavy bass notes hit in the recorded material. During these bass notes, the current demand on the system is increased and can cause voltage drops. 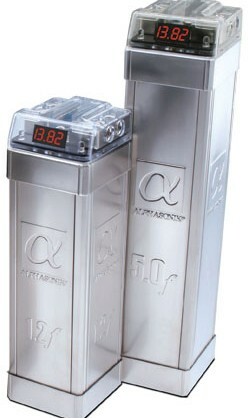 Alphasonik Capacitors act as a power reservoir, supplying added power to keep your system playing strong. 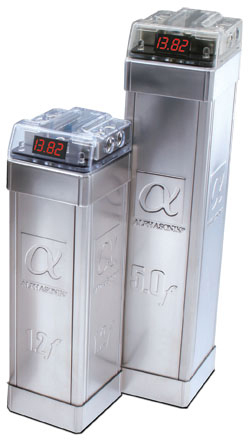 Alphasonik recommends at least 1 Farad of capacitance per 500 watts RMS (1000 watts peak) of amplifier output. This is a general rule of thumb and may be adjusted up or down depending on the efficiency and design of the amplifiers being used. There is no harm in having more than enough capacitance.